WASHINGTON (Reuters) - President Donald Trump and U.S. Deputy Attorney General Rod Rosenstein, who oversees the special counsel investigation into Russia's role in the 2016 presidential election, will meet on Thursday to discuss whether Rosenstein will stay in his job. Rosenstein had spent the weekend contemplating whether he should resign after a New York Times report last week said he had suggested secretly recording Trump in 2017, a source told Reuters. The White House announced the meeting on Monday after a flurry of conflicting media reports about whether Rosenstein, a frequent target of Trump's anger, would be leaving the post. "At the request of Deputy Attorney General Rod Rosenstein, he and President Trump had an extended conversation to discuss the recent news stories," White House spokeswoman Sarah Sanders said on Twitter. Trump, who is in New York for the U.N. General Assembly, told reporters he would meet with Rosenstein on Thursday when he returns to Washington. "We'll be meeting at the White House and we'll be determining what's going on," Trump said. "We want to have transparency, we want to have openness, and I look forward to meeting with Rod at that time." 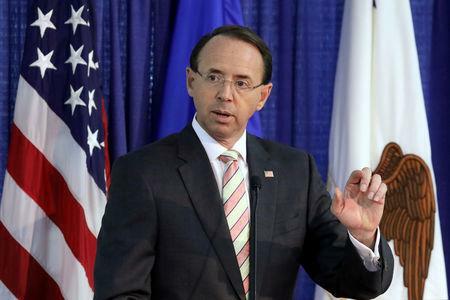 There had been widespread speculation that Trump would fire Rosenstein since Friday when a New York Times report said that in 2017 Rosenstein had suggested secretly recording the president and recruiting Cabinet members to invoke a constitutional amendment to remove him from office. The Times said none of those proposals came to fruition. Rosenstein denied the report as "inaccurate and factually incorrect." Shortly after the Times story, Trump told supporters at a rally in Missouri that there is "a lingering stench" at the Justice Department and that "we’re going to get rid of that, too." Rosenstein's departure would prompt questions about the future of Mueller's investigation and whether Trump, who has called the probe a "witch hunt," would seek to remove Mueller. The investigation has resulted in indictments or guilty pleas from 32 people. The Rosenstein furor came just six weeks ahead of the Nov. 6 congressional elections, and his removal could become an explosive political issue as Trump's fellow Republicans try to keep control of Congress. Thursday's meeting between Trump and Rosenstein is set for the same day that Trump's Supreme Court nominee, Brett Kavanaugh, and the woman who has accused him of sexual misconduct are scheduled to testify at a Senate hearing. If Rosenstein resigns, Trump has more leeway on replacing him while firing him would make it harder for Trump to designate a successor. Rosenstein's future ignited a series of conflicting reports on Monday, with the Axios news website cited an unidentified source with knowledge of the matter as saying he had verbally resigned to White House Chief of Staff John Kelly. Other reports said Rosenstein expected to be fired while NBC News reported Rosenstein said he would not resign and the White House would have to fire him. U.S. Treasury yields fell as much as 2 basis points after the Axios report, signaling investor concern but later pared losses. The S&P 500 also ticked down briefly but recovered most of its losses. Rosenstein has defended Mueller and been a target of Trump since he assumed supervision of the Russia investigation after his boss, Attorney General Jeff Sessions, recused himself because of his own contacts with Russia's ambassador to Washington while serving as a Trump campaign adviser became public. Trump also has blasted Sessions frequently and said last week "I don't have an attorney general." Former FBI Deputy Director Andrew McCabe said he was "deeply concerned" about the reports of Rosenstein stepping down, saying his departure would put the federal probe into Russian election activities at risk. "There is nothing more important to the integrity of law enforcement and the rule of law than protecting the investigation of Special Counsel (Robert) Mueller," McCabe said in a statement. McCabe was fired by Sessions in March after the Justice Department's internal watchdog accused him of misconduct. McCabe charged that he was targeted for being a witness into whether Trump tried to obstruct the probe into alleged Russian meddling in the 2016 presidential election. Rosenstein served for 12 years as the chief federal prosecutor in Maryland under both Democratic and Republican presidents before becoming deputy attorney general in April 2017. Trump appointed him after firing Sally Yates, who served as deputy attorney general under Democratic former President Barack Obama and as acting attorney general under Trump. He dismissed her 10 days after taking office, after she refused to defend his executive order banning people from several Muslim-majority countries from entering the United States.